For centuries monastics have been studying and describing prayer. There are many kinds of prayer each a different approach to relationship with God. One simple approach is to group kinds of prayer along two axes. One axis, which we might call the gesture of prayer, is a continuum on which “kataphatic” is one pole and “apophatic” is the other. “Kataphatic” means your prayer has content such as words, images, symbols and ideas. “Apophatic” means that you pray by emptying your mind of words and ideas to simply rest in the presence of God. The second axis could be termed the arena for prayer, or its reach. “Outer world” would be at one end of the continuum and “inner realm” at the other. Crossing these two axes gives us four quadrants. 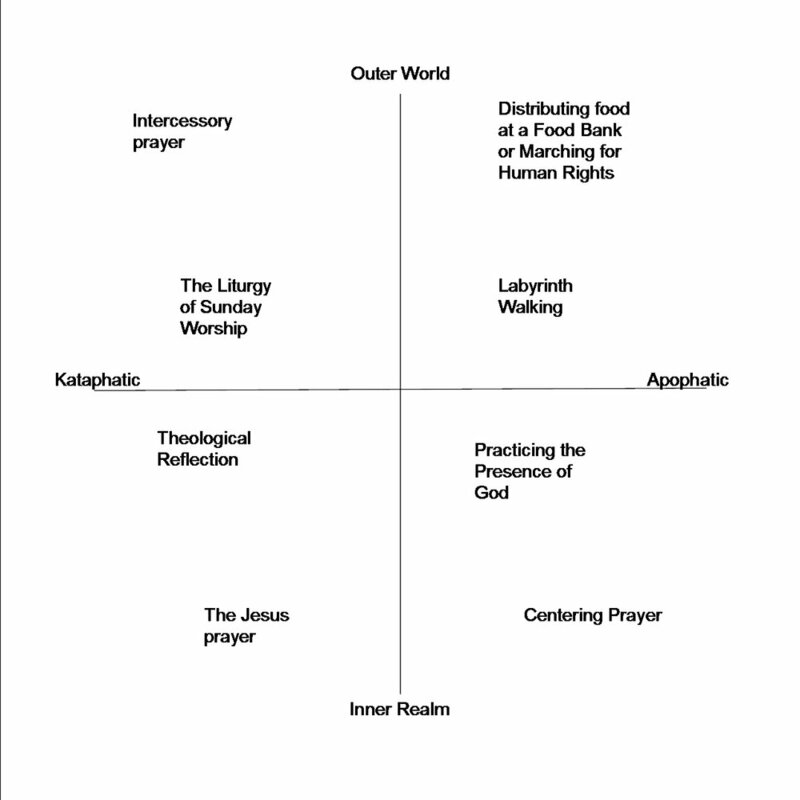 Here is a diagram of a few of the kinds of prayer that we might find in each quadrant. Each of us is naturally drawn to a certain kind of prayer. Since prayer is God's activity within us, it is important that we not judge the different types of prayer. Instead, we must sense what sort of prayer is natural to us and natural to God in communing with us, and to develop that. We can become more intentional, more regular in our prayer life, and more astute in learning what opens us to God. To do that, however, we must practice enough different kinds of prayer to know what is right for us. We must also honestly examine what seems to guide us closer to God and what is simply a part of who we naturally are. Richard Rohr says that Thomas Merton got in trouble with certain members of his monastery because he told the brothers that they were not being contemplative, they were simply being introverted.